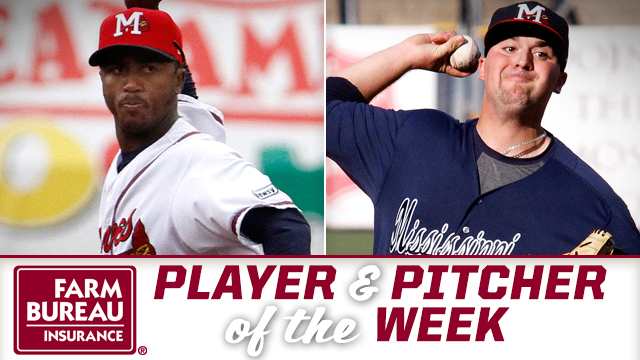 PEARL, MS -- Infielder Ozzie Albies and RHP Rob Whalen have been named Mississippi Farm Bureau Player and Pitcher of the Week for the week ending Sunday, July 3. Albies, 19, is the Braves No. 6 prospect and also ranks among Baseball America's Top 100 at No. 63. In four games since rejoining the M-Braves Thursday, Albies is hitting .444 (8-for-18) with two doubles and a stolen base. Tagged the "Best Infield Arm" among Braves minor leaguers, the Curacao native went to Triple-A Gwinnett at the end of April. In 56 contests, Albies was hitting .248 with 16 extra-base hits and 20 RBI. He started the season at Double-A Mississippi where he posted a .369 batting average with eight extra-base hits and seven RBI through 22 games. The shortstop was signed by the Braves as a non-drafted free agent on July 2, 2013. Whalen, 22, made one start and picked up the win this past week. He held the Generals to one earned run on five hits and two walks while striking out seven in seven innings of work. The right-hander is 6-5 with a 2.34 ERA in 16 starts for the M-Braves this season. Opponents are hitting .220 against Whalen. He was acquired by the Braves along with RHP John Gant from the New York Mets in exchange for Kelly Johnson, Juan Uribe and cash on July 24, 2015.